Trump issued single, terse tweet on Saturday that sent his 'deepest sympathies and respect' to family, without any words for McCain himself. Washington: Donald Trump rejected a statement prepared by his aides that praised John McCain, according to the Washington Post, underscoring the US president’s enduring scorn for the late senator and war hero. While tributes have poured in highlighting the Arizona Republican’s lifetime of service, Trump issued a single, terse tweet on Saturday that sent his “deepest sympathies and respect” to the bereaved family, without any words for McCain himself. The absence of a formal communique from the White House has raised eyebrows and was all the more conspicuous after Vice President Mike Pence along with most of the cabinet, press secretary Sarah Sanders and all the living former presidents had issued their own statements over the weekend. Citing unnamed current and former White House aides, the Post said Sanders, Chief of Staff John Kelly and other senior staff had advocated for a statement that called McCain a “hero”. The statement was prepared and given to Trump for his approval, but according to the paper the president told aides he preferred to tweet instead, and it was ultimately not released. McCain was one of Trump’s sharpest critics, and made clear in one of his final wishes as he struggled with brain cancer that he did not want the president to attend his funeral. 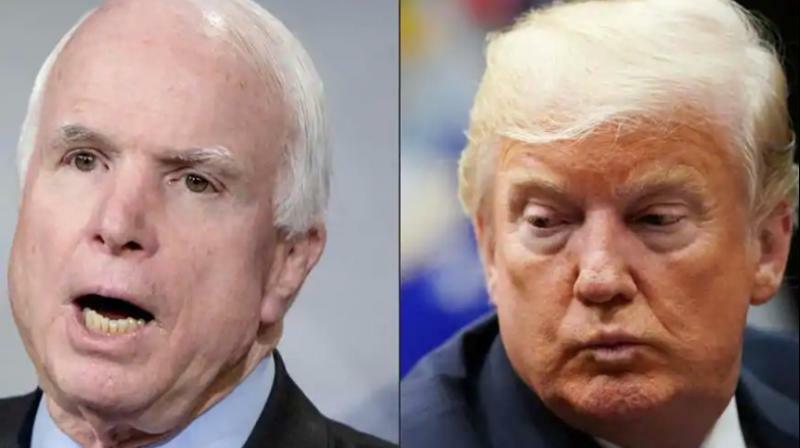 He went on to attack McCain’s service in the military, saying of the onetime prisoner of war: “I like people that weren’t captured.” As McCain’s health ebbed, he missed few opportunities to lash out at the president. He was one of just three Republican senators to vote against -- and thus defeat -- a Trump-backed effort to repeal Barack Obama’s signature health care law. Following McCain’s death, admirers have recalled with fondness his insistence on fair and civil discourse — in contrast with the frequent incivility of the US president and his habit of coining unflattering descriptions of political foes.